Starting today, I’m going to be posting most Fridays (life happens, so there may be a Friday that I miss) on a dish that I made with what I had on hand in my pantry, refrigerator, and freezer. No running to the store for a last minute item, just doing what I can with what I have. Most of these recipes are going to be healthy, and have a vegetarian bent, but not all of them will, since Master Chow looooooves chicken. And beef. And lamb. And pork. 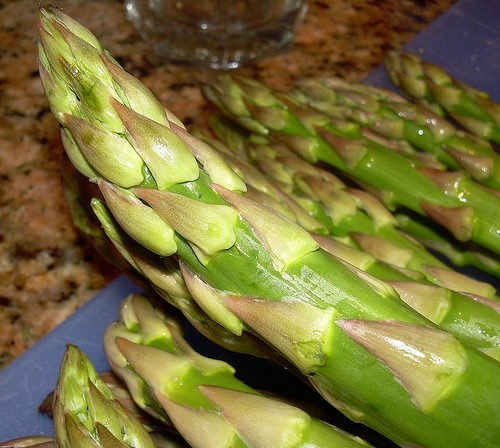 This week, it’s asparagus, which we are starting to see in stores in my neck of the woods. Asparagus with thick stalks tends to be more flavorful, and if you cook it the way my mom showed me, you will end up with the tenderness that makes some folks fans of thin-stalked asparagus. 1. Start by holding up a stalk and snapping off the base, then use that one stalk as a guide to cut off the base of the other stalks. I save those bits (cleaned up) to throw into soup. 2. Next, peel the thick base of the stalks with a vegetable peeler. My mom often skipped step 1 and went straight to this step. Sometimes I do, too. 3. Steam of boil under tender – al dente – but not mush. For thin stalks this can take 2-3 minutes, for thick stalks, it can take around 6. Bottom line: don’t walk away. 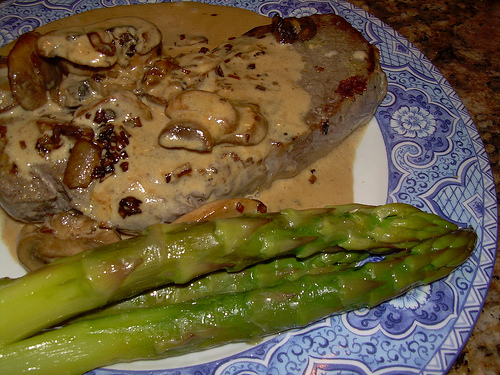 You have to keep testing to see if the asparagus has reached the right level of doneness for you. 4. Drain the asparagus, and while it’s still hot, drizzle with extra virgin olive oil, red wine vinegar (or balsamic), and kosher salt or sea salt, to taste. This is quick, easy, and delicious. Enjoy! Isn’t asparagus wonderful? It’s such a simple delicious vegetable. I love asparagus season, every year I buy even more than the last. That just how I do mine. In the few years I took our boys to our place on Lake Michigan in early June, I would get in on the early asparagus. We’d buy it on the way home from shopping at little road side farm house stands. Talk about fresh!! Beautiful color. What a great idea! I’ve been thinking I need to start using stuff I have in the pantry instead of running to the store. Great idea and quite timely considering what’s been going on. If only I could always come up with something that looks so good just by opening the fridge. Excellent idea and great theme for a Friday.